Students Kidnapped In Cameroon Are Freed, But Questions Remain The students were released at another school 12 miles away. A principal and teacher reportedly remain captive. Tensions in Cameroon have heightened as an Anglophone separatist movement has taken root. Schoolchildren who were kidnapped by armed men were released and helped into a truck by police in Bamenda, Cameroon, on Wednesday. Nearly 80 children who were kidnapped by armed assailants from a school in northwestern Cameroon have been released by their abductors and are being reunited with their parents. But it remains unclear who the kidnappers were and why the children were taken. The government has blamed the abductions on separatists, who in turn say the government is responsible. The students, kidnapped Sunday night from a Presbyterian school in the northwestern city of Bamenda, were released at another school 12 miles away, The Guardian reports, noting that it's also unclear how they were transported given a curfew that was in effect at night. A principal and a teacher who were abducted along with the children are still being held, Reuters reported. "They look tired and psychologically tortured," Fonki Samuel Forba, moderator of Cameroon's Presbyterian Church, told The Associated Press. Forba asked the parents of children at the boarding school to take them home, as their safety could not be guaranteed. "It is unfortunate we have to close the school and send home 700 children," he told the AP. "Their security is not assured by the state and armed groups constantly attack and kidnap them." The school suffered a separate kidnapping incident on Oct. 31 in which 11 students were taken and later released, according to the Guardian. Cameroon has a majority of French speakers, with a significant minority of English speakers in the country's western portion. Originally colonized by Germany, the country was split into English and French portions following World War I, and both French and English are official languages of Cameroon. Tensions have been growing in the country since late 2016, as initially peaceful protests by the Anglophone minority over perceived marginalization turned into a secessionist movement in northwestern and southwestern Cameroon, in opposition to the Francophone-dominated government. Hundreds of people have been killed in the country as the separatist movement has taken hold, and the government has put down any efforts to secede. The country's 85-year-old, French-speaking president, Paul Biya, was inaugurated into his seventh term on Tuesday. In an address, he promised to increase decentralization: "Measures will be taken as soon as possible to broaden the powers of local authorities in order to provide them with the means for greater autonomy. Bilingualism and multiculturalism will continue to be promoted by the commission set up to that end." Biya asked people in the Anglophone regions to "lend all possible support to the action of the authorities aimed at restoring peace. They know, better than anyone, what their life would be like under the yoke of extremists who have been spreading terror and desolation in their regions for some months now." 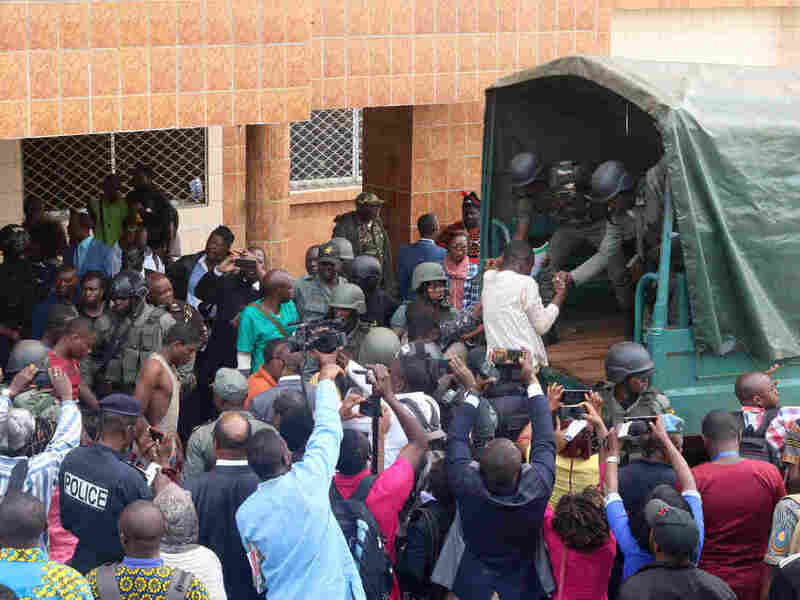 On Tuesday, the U.S. State Department condemned the kidnapping and expressed concern over what it deemed the "burgeoning Anglophone Crisis." "We urge an immediate halt to the indiscriminate targeting of civilians and burning of houses by Cameroonian government forces and to attacks perpetrated by both Anglophone separatists against security forces and civilians," the department said in a statement from spokesperson Heather Nauert. "The systematic intimidation based on ethnic and religious affiliation, including in Yaoundé and Douala, must stop." An American missionary was killed inside his car in Bamenda last week when he apparently was caught in crossfire. NPR Africa correspondent Ofeibea Quist-Arcton contributed to this report.